I have followed Agazian Identity politics for such long time. Yes six months or more. It is so long and boring but worrisome. I followed it seriously for such longtime though everytime getting bored because from the let go, I never missed to put them where they belong. I understood that they are fascists who do not have any essense of respecting humanity. Now that we are coming into another stage of the Agazian politics, I would like to share my penny remark. Hope you will stay with me till the end. It is disappointing how we try to compare issues that matters Eritreans collectively. Agazians are dismissive and the entire Eritrean family are potential victims of their propaganda outlet. I am disappointed when some people picked this issue from a specific, equally has to be treated issue, focusing as if it matters only to, Moslem Eritreans, or Jeberti people, or Saho people. Such approach is really very narrow and dangerous. Agazians are not saying we are Eritreans. They are just Agazians. Hence, this movement is is against Eritrea and Eritreans except, the Christian Ortodox of Tigrigna Speaking highlanders. Agazians are against the very essence of 1890 Eritrea, against all the struggle we did against Italians, British, Ethiopians, even the struggle to secure our border does not belong to them. The human suffering we face does not belong to them. In fact, they are in the movement to create a new country called, Agazian for the Agazians. I am disappointed with some notable folks in the opposition camp when they try to rebuff Agazian Movement from an equal but the other camp of Identity polical point of view. I get disappointed when they build a reflective of their identity politics as a tool to combat anothet identity politics mixed with religious sentiments. Can’t we just stand on a just struggle of humanity and proclaim our prnicples dignified on the concept of “JUSTICE”?. Justice is justice and has any other struggle that can defeat it unless it is buried temporarily. The struggle for justice never terminates once ignited no matter who comes in and departs. The word ‘Justice’ will always be there to knock every mind, bet it crazy or sane. The crazy will ignore it or work against, the sane will bring it and make it alive. Eritrea is not that of 18thC. Eritrea is not that of 1991 or 1993. Eritra is that of 1890. Anyone who is within Eritrea since then can go noo where. No matter what he thinks, Eritreans who live within this territory can go no where. No one unless he/she wants to go. Our duty is not to tell them to go if they want but to show what their bad idea is. If one thinks to be an outsider, let him/she be. Respecting the rights to think should be our motto. For whatever thinking it comes, we can not stop thinking though we can defeat it. Within this regard, Agazian ideology is fascistic and we need to show them just that and fight for any step they do. We can contain them within the Eritrean territory, without deploring them and rebuff their ideology. Lets not be too angry to deplore people. Lets contain and defeat them. 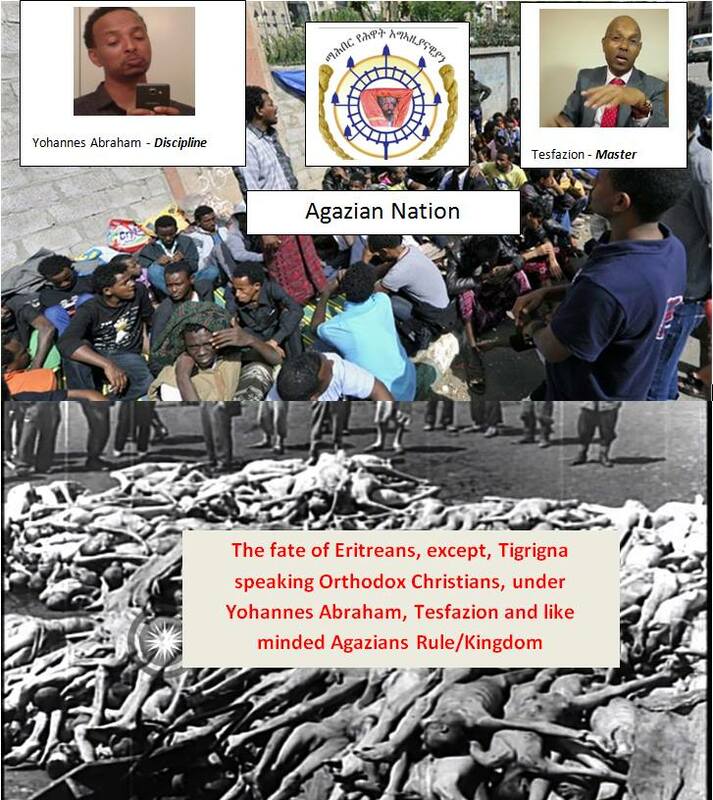 In my view, Agazian movement is a fascistic movement that targets the entire Eritreans. And I believe and have trust on Eritreans enormous capacity and bravity to mainatain Eritreanhood. Eritrea, if we believe that it is the country for everyone, lets keep this atmosphere alive while challenging any challenge that comes within it. 1. Ignore human rights issue and forget the people. 5. Re-create the horn of Africa in line to the politics of identity. To some extent, these fascists have accomplished some of their primary targets. From the very beginning, they were anti-humanity and hence no need to put it in the list of accomplishment. But they tried to fabricate Agazian Identity based on lies and unscholarly misguiding referenced analysis. Eritrean politics, which is a term that represents the opposition camp, is some how is heating up. It is because there are Identity Politics funs who were expecting this to come. Now, they are so happy to see their moment has come. The fourth level is hard to believe on it will come this sooner. but thanks, some prominent opinion givers and news media, like SBS Australia, are giving it due coverage from academic point of view. It is disappointing these powerful outlets giving it a status of academic subject to be dealt with. If Agazian’s concept was contained where it belongs, a fascistic movemnt, then it can be very easy to defeat is. Agazian Identity politics will be a favorite acadamic debate by those who worked relentlessly on this line – especially -the majority-Minority Political approach. They will will enjoy it. The sad thing is: “they will only aggravate the issue they raise from to time”. Without it, they can not strive. But there are people who will be champions in this battle: people who work for human rights, people who love humanity. Those who take Eritrean problems at a humanitarian issue level, the highest form of all struggles. There are very notable people in this area and I still trust for their work to be a path to our dream country – a country that respects humanity and human rights. Agazians hate Human Rights. They hate it. They know they will be defeated when people stand for human rights issue. Till now, Agazians are fine – because they are just intering into a already sowed seed of hate and identity issue. Those who forgot Eritrean problems is a problem for all, now are joined by Agazians. It is good for them. These politicians were expecting this for such long time. Now, they have stepped a million steps into the chaotic media of Eritrean politics. I wish such political parties didn’t exist. I am saying this, because because they saw a seed – that they can probably harvest it. And what they saw is “hate”. Eritreans who are proud to call themselves Eritreans, no matter what history they own, -s – lets contain Agazian ideology in the area where it should be contained. Agazians are anti-humanity and lets stand againts this. Lets unite our forces to defeat their fascistic agenda. Jeberti will not defeat them, Saho will not defeat them – Moslems will not defeat them -Catholics will not defeat them. Only those who stand for humanity will. Agazians hate humanity – and to defeat them – lets love humanity. It is totally and deliberately misguided for one reason from scientific perspective either. Let history or story of 3000 be “true” but history or story to evolve (evolution) that is why we have contemporary history, state either. Neither ancient/colonial nor contemporary turnoff each other–while there is vaccum in human kind history, no one should chopp body parts unless…..I think history is story of continuity as construction of identity is in the age of nation-state system.